Windows 10 is likely to be able to make calls as well. 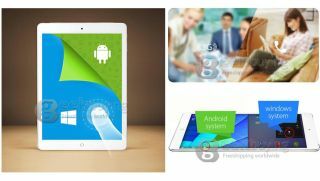 One of the myriad of smaller Chinese companies that produce tablets and smartphones, Onda, has unveiled a tablet that not only runs both Windows 8.1 and Android (KitKat) but can also apparently make phone calls in Windows (and probably in Android too). The V9191 3G Air is currently on preorder from a number of online vendors from as little as $257 (about £170, AU$ 280) with delivery expected towards the end of this month. Like many Windows tablets, it's powered by an Intel Bay Trail-T Z3736F quad core processor with 2GB of DDR3L memory and 64GB of storage. It also features a 9.7-inch 2048 x 1536 pixel display, just like Apple's Retina Display iPad tablets. Other notable features include a pair of cameras, a microSD card reader, Bluetooth 4.0, a big 6200mAh battery, HDMI, microUSB and microHDMI ports. We reached out to both Geekbuying and Onda. The former confirmed that phone calls could be made under Windows 8.1 rather than just Android – which would be the first reported instance of that happening. That shouldn't come as a surprise though given how the minimum hardware requirements for Windows (desktop) and Windows (mobile) are practically identical. Expect many more of these hybrids to come to the market with Windows 10's launch looming.